Me preg checking a cow that was just dried off. It’s easy these days to overlook the world around us. When we become so focused on our day-to-day lives, skim our surroundings, often the convenience of everyday items are taken for granted. But, there’s a relentless ability many of us gradually lose overtime: the power to ask how. Start with the kitchen and look in your fridge: how do eggs make it there without breaking? How come bananas have don’t have seeds? How does a pineapple grow? How do they make pasta comes in so many different shapes? I’ll confess, I’m guilty on several counts of failing to wonder how. If you’ve ever spent a few minutes with a 6-year-old child, the power of asking how can quickly escalate into questioning your very existence in the universe. But while we grow up and make the transition into adulthood a certain point is reached, and for many of us, this is when we stop asking how. Instead, we become very irritated when these everyday food items are not available, with little consideration of what goes into their production. Mel castrating a bull calf. Prior to my internship at Van Ryssel Dairy, I had to come up with a list of what I anticipated to learn from my experience. As would be expected of a pre-vet, my list consisted of mostly ideas that pertained mostly to large animal veterinary practice. I wasn’t let down, and in just two months the amount of practice and experience with treating animals was incredible and extent of the information I took in at times was almost overwhelming. But what really sticks out in my mind when I look over the past few months of my internship at Van Ryssel Dairy, was the realization that even though I have consumed dairy products my entire life I was amazed and a bit embarrassed about how little I actually knew about milk production. And furthermore, I’ll admit, I learned that I grew up my entire life, unknowingly, literally five minutes away from the dairy farm I interned on. While it’s clear that veterinary medicine cannot be overlooked as an important aspect of a dairy, I also saw that it is also just a small part of the entire dairy industry. This year I’m graduating from Cornell. When I get asked what I am majoring in, I say I’m studying Agriculture Sciences. But the truth is, we are all in agriculture. If you are asking yourself right now “how can we all be in agriculture when something like 1% of all Americans actually still farm today?”, you are on the right track by asking how. Regardless of whether you grew up on a farm or you are you are an agriculture professor, or maybe your from a big city and haven’t taken any agriculture classes at all, we are all in it. The point I’m trying to get across here, is that at some point yesterday, today, and tomorrow you will eat. And just by the act of eating alone, without physically growing your own crops or raising livestock, you have become a part of agriculture. It doesn’t matter how far you live from the farm. It is important to realize that we all have a responsibility to stop before we take the next bite and ask how. I can promise you, you will be absolutely amazed with what you find out. There are a lot of misunderstandings and misconceptions that exist all the way from the farm to the grocery store. In my opinion simply asking how is the most basic way of studying agriculture and becoming a more educated consumer. Peter (middle) with the vets on herd health day. As it is my last post for my 2010 summer internship, I would like to thank Peter, Frank, Mel, Michaela, Rosalie, Cara, and Alex for a phenomenal summer at the dairy. 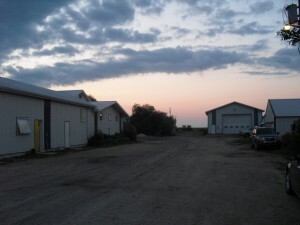 I would also like to extend a thank-you to Neil and Rosalie Van Ryssel for allowing me to work on their farm. I look forward to returning in January. Rosalie in the milk parlor. The vets arrive every second Tuesday morning. It’s 7:42 a.m. Tuesday morning. You slept through your alarm, half way to work you realize you forgot your coffee on the kitchen table, and by looking in the rear view window you see that your hair is a mess. At 8:07 a.m. you arrive at work seven minutes late. A bad start to the day, and at some point we have all had at least one or two, or so we think. Let’s start again but this time as a cow. It’s 7:42 a.m. Tuesday morning. You’ve just barely lied down after being milked, you haven’t had a chance to taste the fresh silage in front of you yet, the vet spots your ear tag and it matches the number on the list. At 8:07 a.m. with your head in the head-gate you consider urinating, but no need the vet has already done that for by putting pressure on your bladder while he rectally palpates during your pregnancy check. Congratulations, your 28 days in and eight more months to go. A vet checking a “fresh” cow for a uterine infection after recently calving. Herd health is a fundamental aspect in maximizing production in any dairy operation and requires cooperation between the farmer and the farm veterinarian. The role and the procedures used by the veterinarian in large animal practice has transformed as animal agriculture has advanced overtime. It’s not just about treating sick cows anymore. In fact, the vet rarely does the on-farm treatments. Giving daily needles, pills, wrapping legs, or drenching cows is all done by the farmer. So what does the vet do then? On a dairy farm, knowing who is pregnant, who can be bred, knowing who is where in their 21-day cycle, and knowing who is cystic (meaning they have a cyst on one or both of their ovaries) is very valuable information in ensuring the reproductive side of things is running smoothly. The vets are also critical in giving input when making management decisions, coming up with many preventative measures, and of course surgical procedures like a cesarean section for example. 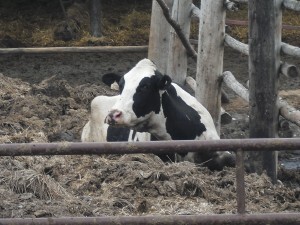 This cow broke through a fence and got herself stuck in a pile of mud. 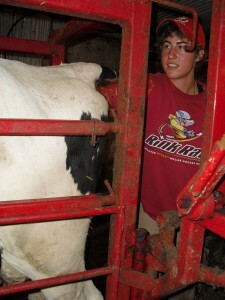 “Preg checks” are a large part of what is included in the biweekly herd health. 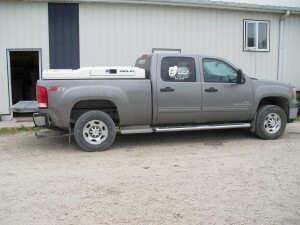 The vets at Van Ryssel Dairy use portable ultra-sound backpacks for preg checking. The image forms on the pair of glasses they wear over their eyes. It is possible to successfully preg check this way at 28 days as opposed to the standard method of rectal palpation where the animal can be successfully preg checked at 45 days. As you can see, the ultra-sound method can tell you about half a month earlier who needs to be bred again by artificial insemination, which is extremely advantageous. There is one bull kept on farm, Alex, who is the clean-up bull used to ensure those cows not able to be bred by artificial insemination are pregnant by natural means. 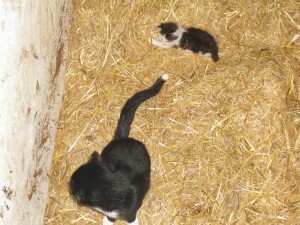 EIi, the kitten and her mom. My ride at work. 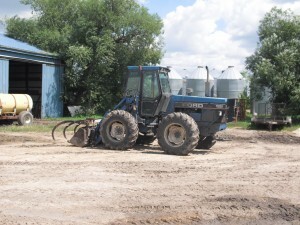 The attachment on the front of this tractor is specialized for grabbing bales of hay or straw. In my position of field assistant this summer, I have been working on two different projects. One has been underway for several years and is looking into the ecological as well as economic impacts of different cropping systems (for vegetable and field crops). The other looks more into the effects of fertilizers on weed competition. The latter project is in its first year and is under the direction of a graduate student. I will use this post to describe the research work I have been participating in this summer. The organic cropping rotations project is being done on two different sites- the Vegetable Crop Research Farm in Freeville, NY and the Musgrave Research Farm outside of Aurora, NY. Both are Cornell facilities and at Musgrave, we have our field crop plots. At the Musgrave Farm, we have 4 replicates of 5 different treatments to the same field crop rotation. The rotation is soybeans to winter spelt under-sown with clover to corn (a three year rotation). Each year, there are two entry points and so this year, we grew the winter spelt/clover and corn. Next year will have corn and soybeans. The five systems of the plots at Musgrave represent different management practices for inputs of fertilizer and tillage. In System (1), we use the recommended nutrient application rates for conventional management and normal tillage practices to control the weeds. Of course, for fertilizer, we use composted manure to follow organic management practices. System (2) aims to have lowered inputs both for nutrients and labor (cultivation) in order to maximize profitability. (3) has the intensive weed management i.e. more cultivation to remove any unwanted weeds and normal fertilizer rates. This system tends to be the most laborious. 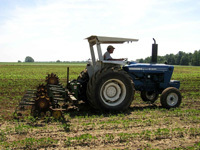 System (4) has reduced tillage with normal fertilizer application. The system 4 plots tend to be the hardest to collect data from because of the constant fight with weeds. The last system, (5), is the straight conventional plot where we use a conventional chemical fertilizer and use a early season herbicide on the plots. We use this plot to mark to the performance of the organic plots against the conventional system. System five needs to be a certain distance away from the organic plots under organic law so there is a buffer zone in between these systems. Throughout the season, we are collecting data on all of these systems for weed and pest counts and identification, nutrient and biomass yields, as well as the profitability of the system. At the Freeville research farm, we examine similar aspects but in a slightly different manner because we are working with vegetable crops. Here, there are only 4 different system types and each are on a 4-year rotation. The systems differ on the intensity of the land use again but with a slightly different spin. (1) An intensive system with high inputs of fertilizer, no legume cover crops, and we harvest 6 cash crops in the 4 year rotation. (2) This system has an intermediate intensiveness with a low fertilizer application, heavy legume cover crop integration, and 4 cash crops harvested in the 4 years. (3) An “extensive” system whereas there is a low fertilizer application, heavy in legume cover crops, and only two cash crops taken off in the 4 year rotation. (4) The last system uses a ridge tillage technique to cultivate the plot with the same input/output levels as the intermediate system. This style of conservation tillage can be productive but tends to not work in our test plots and is very evident at juxtaposition. The fertilizer used in these organic test plots are a compost and this year we used compost from the Cornell industrial composting facility. The four vegetable cash crops used in this study are winter squash, fall cabbage, lettuce, and potatoes. A great benefit to working this position is that there is an unlimited supply of these vegetables come harvest time. The majority of my work surrounding this project has been collecting data on these plots. We have collected data on growth of the crop, identification and sometimes weight of weed biomass, time of hoeing, pest occurrence, and nutrient sampling of crops and weeds. The data we collect will give us a picture of nutrient input and output as well as the agro-ecology of the test plots. The other project I have been working on this summer that is under the direction of a Cornell graduate students looks into nutrient’s role in weed competition. 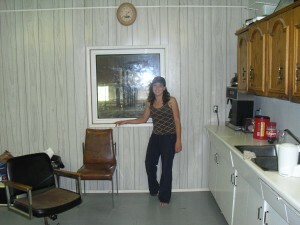 It is a very interesting topic and has been a lot of work for her getting it going. The main reason for the mass of work involved with this project is the set up. With five species under examination, partitioning N/P/K, at 4 different application rates, and with 3 repetitions; there are 330 different testing stages that we most go through for every activity. With this number, any activity is quite the tedious job. To work for science tends to be quite tedious and I have been able to form my own interests in research work through this. The project’s purpose is to find the point where crops max out their own utilization of the nutrients applied and weeds continue to use the nutrient stores in the soil to increase biomass. This research would help out organic farmers with the decision in the amount of fertilizer to apply. The project partitions NPK into the individual nutrients and simulates the amounts of that nutrient at varying levels composted manure applied. The setup of the project is sort of quirky and, as I said, has been a lot of work doing. In order to separate each of the 330 experiments into their own, isolated area, we have built 330 square boxes of wood to put in the ground 330 times and filled with an amended soil 330 times. This doesn’t include planting and thinning 330 boxes of plants and measuring 330 different boxes of plants for growth data. It has been quite exhausting but fun when you work with the fun group that I had this past summer. 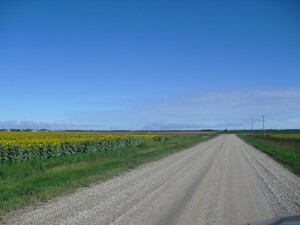 The experiment uses two crops and three different but common weed species. 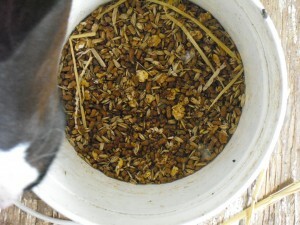 The partitioning of the nutrients from composted manure are in the form of Bone Char for phosphorous; blood mean for nitrogen; and potassium sulfate for potassium. The amount of these nutrients are derived from the amounts that would naturally be found in composted manure. So then we even differentiate the amounts amended to the soil in the boxes by the relative lbs/acre of N. These rates are 40, 80, 160, and 320 lbs/ acre of N.
Filling the in-ground boxes with the amended soil. This project looks into a really interesting concept for agriculture and I feel that I a lot can be learned from this study. One thing that I have already picked up from this experiment is the monotony of research work. This eludes to a major theme that I have uncovered from this summer’s work. That academic research work is very important for education and progress but also that I may not choose it exclusively as a profession. The drive to the dairy. The key to milking is sanitation. Everything from the milking machines, to the bedding after milking, to the cow’s teats has to be clean to ensure quality milk and to prevent infections in the animals such as mastitis (a common bacterial infection of the teat). At Van Ryssel Dairy the cows are milked twice daily. The morning milking is at 5:00 a.m. (and trust me, the cows think this is early too) and the afternoon is at 4:00 p.m.. There are approximately 125 milking cows in the herd and the parlor can milk 20 cows at once. 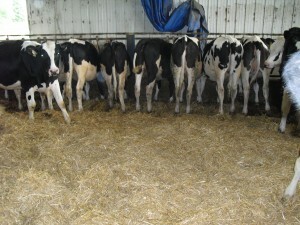 There are three groups based on there milking status: the high group, the low group, and the third group. The third group is made up of “fresh” cows-ones that have just calved with relatively high milk production. The high group makes up the majority of the milking herd and the cows have high production. 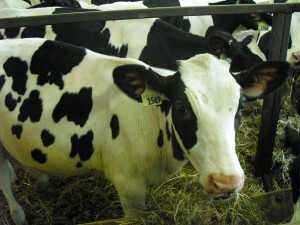 If the fate of the cow is to remain in the milking herd, at about 60 days after calving the cow can be bred once again. The low group has cows that are further along into their lactation period, and thus will have lower milk production. Cows in the low group are likely pregnant and will eventually be dried off and are no longer apart of the milking herd until they calve. 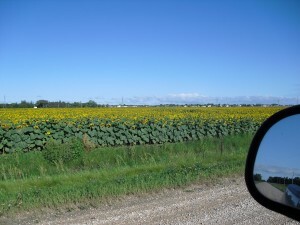 Field of sunflowers owned by the farm. The first step for milking is the sanitation process where a solution of hot water and detergent are flushed through the milking machines. The cows have to be brought from the barn to the parlor at this time, and their stalls are bedded while they are milked, which is what I normally do. Like I have mentioned above, it is important that the bedding is clean and dry for when the cows lie down because their teats remain open for about half an hour after being milked. Most cows by now know the routine, however some have a selective memory and need to be reminded. For sanitation purposes the cows have there teats pre-dipped and post-dipped with iodine to prevent infection. 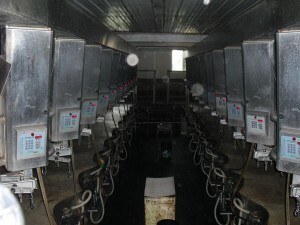 For most of the cows, the machines are put on “auto”, but there are some exceptions for those with abnormally placed, sized, or numbered teats and those cows are placed on a “manual” setting. In this case, “one size fits all” doesn’t apply. Only one person does the milking. 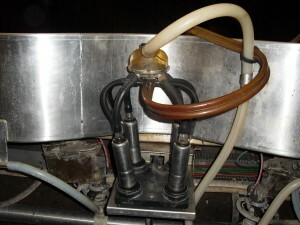 Each milking machine consists of four vacuum suction-cups and has the ability to be maneuvered and manipulated into a comfortable position by the milker onto the teats. If the machines are set to auto, they will fall off the cow automatically when milking is complete. 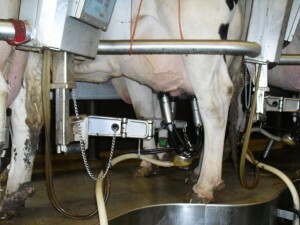 Milking machine with four suction cups. Some of the cows coming into the parlor have red bands around their legs. This indicates that milk from these cows cannot enter the bulk tank because the animal is receiving treatment with drugs that have a specific withdrawl time. 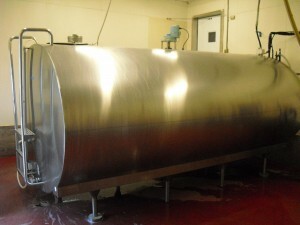 It is extremely important the milker takes notice of these cows and removes the tubes going into the bulk tank and connects them to a separate container, otherwise any milk previously in the tank is contaminated and no longer able to be sold. You might wonder why these cows with red bands are even still milked, however it is important that they are, especially if they are high producing because the pressure and discomfort the cow will experience in its udder. Every cow that is milked has a “responder” around its leg. The responder is really a computer chip with the cow’s identification number that a sensor picks up in the parlor. 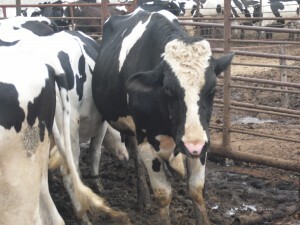 In addition, the responder records the amount the animal milks at that milking and acts as a pedometer to record the animal’s activity levels. An average quantity of milk produced by one animal at one milking is about 17-18 liters. A pedometer is useful because by recording and monitoring how many steps the cows takes overtime, the information can be used to notify when the cow is in heat and can be bred. Milking cow sporting a responder. Cow hooked up to the milking machine. From the parlor, the milk travels into the bulk tank where it is stored. Every second day the milk truck arrives on farm to collect the milk. At this time, there is any where from approximately 6000-7000 liters of milk in the bulk tank depending on factors such as how many total cows are being milked or how many red-banded cows there are. The dairy industry in Canada differs from the American dairy industry in that Canada uses a quota system. This means the milk produced by all farms in the area is transported to the same place and from there is distributed to the major dairy companies for further processing whether it be for cheese, yoghurt, cream, ice-cream, or simply milk. Gary Barletta, co-owner and winemaker at Long Point Winery in Aurora, NY, has been a familiar face in the Finger Lakes Wine Industry for many years. Barletta grew up in an Italian neighborhood in Syracuse, NY where his grandfather introduced him to the art of winemaking. In 1976, Gary began making his own wine from an old press in his grandfather’s basement. Gary and his wife Rosemary then turned their passion into a profession in 1999 by establishing Long Point Winery on a beautifully scenic plot of land on the east side of Cayuga Lake. Since it’s establishment, Long Point Winery has won many awards for their high quality wines. Q1: Is winemaking an art or science? It’s an art. If it were a science then every vintage would come out tasting the same. Of course there is a lot of science involved, but it (winemaking) would be much more standardized if it were just a science. Instead, you have to give it your own touch and adjust it according to taste, and that’s the bottom line: how it tastes. So in that sense, it’s much more of an art. Q2: What are the biggest challenges facing the Finger Lakes wine industry? For this area the biggest challenge is marketing and marketing properly. For years we (Finger Lakes) have been known for our Concords and Catawbas. But in the last 30 years, we’ve been growing some really nice viniferas and showing the world that we can produce high quality vinifera wines. Q3: What is your winemaking philosophy? My philosophy is to try to make the best wine possible. We don’t overcrop our vineyard, so we have a lower yield for a higher quality fruit; quality over quantity. Q4: What is your favorite wine? Zinfandel. I really like the blackberry, pepper, and spicy characters in the wine. It pairs with many different foods. In fact, Zinfandel is the only red wine I’d recommend with seafood. It starts with a Moo. No, this is not a beautiful sunset. It is actually the sunrise as I arrive at work for my 5:00 a.m. shift. It’s a boy! Well a bull calf any way. I had arrived early for my shift at work just in time to see two hooves sticking out the back end of the cow 1105. Right then, I grabbed my camera to capture the action. Fortunately, 1105 looked like she had everything under control and it looked like a normal calving was about to ensue, because to my knowledge there are no prenatal classes for cows. Not that any class could really prepare you for giving birth to something that weighs at least 100 lbs..
Two front feet sticking out. 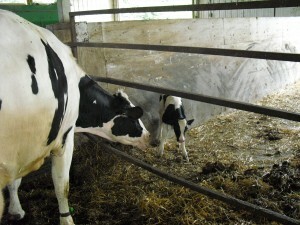 As 1105 enters more advance stages of calving, the contractions become more frequent and she lies down in the far corner. Given the circumstance, she seems calm and ready to get rid of the calf she has been carrying around with her for about nine months, and the other cows in the pen with her become curious. With each push more and more of the calf emerges headfirst with its eyes now open, seeing the world around him for the first time. Not ever having used the video setting on my camera, I prayed that it was recording because I don’t think either the calf or 1105 would have been too willing to start this process over again. As 1105 pushes, the calf's head emerges and his eyes open. Unfortunately for him, his first view of the world is another cow's backside. Not too sure why she thought this would be a good place to lie down. With a final push, the calf is expelled. Shortly after, Mel ensures the calf is stimulated to breath by tickling its nose with a small piece of straw. Within seconds 1105 is up checking up on her newborn and begins cleaning the bull calf. It wont be long before he will be up and walking wobbly on his own to begin nursing. The first 12 hours of life are crucial for the calf to receive colostrum in the milk from its mother. The colostrum contains immunoglobulins that are passed on from the mother to the calf to strengthen the calf’s immune system against many potential pathogens. 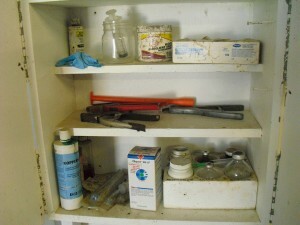 Cabinet of implements such as a pair of ear taggers and some of the drugs commonly used for looking after the calves. 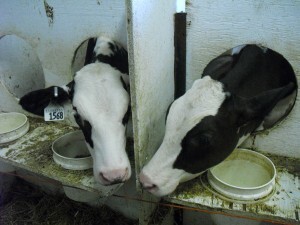 The calf and 1105 have only a few hours together. At afternoon milking time they are permanently separated. 1105 is a “fresh” cow, meaning she has just calved, and will join the ranks of the milking herd. The new bull calf is moved out of the calving pen and into the calf barn with the other calves. Instantly, he has at least 25 new calf friends. For the next three days he will continue to receive colostrum milk twice a day from his mother that is saved in a bottle when she is milked and brought back to the calf barn. For eight weeks calves will receive regular milk and quickly learn to make the transition from bottle-feeding to drinking milk out of the bucket- some more quickly than others. For eight weeks following that, they are fed calf starter, and once those eight weeks have passed they are gradually transferred onto a pellet diet. 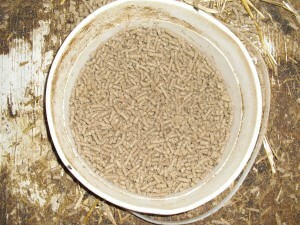 Medicated pellet feed for the older calves. While testing out his wobbly legs this new born calf has managed to stumble over to the wrong side of the fence as his concerned mother looks on. The fate of heifer and bull calves diverges at a certain point. The heifer calves are ear tagged and given a shot Calf-Guard to vaccinate against respiratory diseases, as they are hopefully to one day become replacements in the milking herd. Bull calves are of very little use to a dairy operation because they do not produce milk. They are raised for veal and often sold to buyers if they are not kept for the farm itself. When their horns start to grow, the calves start to look like the little devils they can be sometimes. Earlier at the start of my internship, a very special calf was born. Affectionately called Allie by the farm, she was born about 45 days premature and was about 1/3 of the size of an average calf. 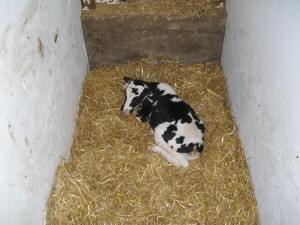 Commonly, calves born this early will not be healthy, or won’t even survive. However, after nearly a month to the date, I am happy to report that Allie is doing well and has even grown a bit in size. The young heifer calf Allie, a few days after she was prematurely born.